Setra’s SRIMV is a multi-function non-BACnet device designed to monitor velocity while also giving the user the option to measure and display flow, differential pressure, temperature and humidity. Setra’s SRIMV is a multi-function non-BACnet device designed to monitor velocity while also giving the user the option to measure and display flow, differential pressure, temperature and humidity. The SRIMV offers three velocity ranges as well as three pressure ranges, giving the user the option to choose the appropriate range for their application. The SRIMV has a 3-color backlit display for easy menu navigation and audible/visual alarm capability for velocity, flow, pressure, temperature, humidity and door input. The velocity and flow measurements are based on differential pressure and require the use of a single point Pitot tube or averaging probe. Simplify Your Velocity Measurement - The SRIMV offers velocity ranges of 2000 ft/min, 4000 ft/min and 8000 ft/min. The SRIMV automatically calculates the velocity and volumetric flow rates based on differential pressure, eliminating the need for a manual square root calculation. Alarm Everything That You Monitor - The SRIMV provides audible and visual alarming for pressure, temperature and humidity to give you piece of mind in your critical environment. 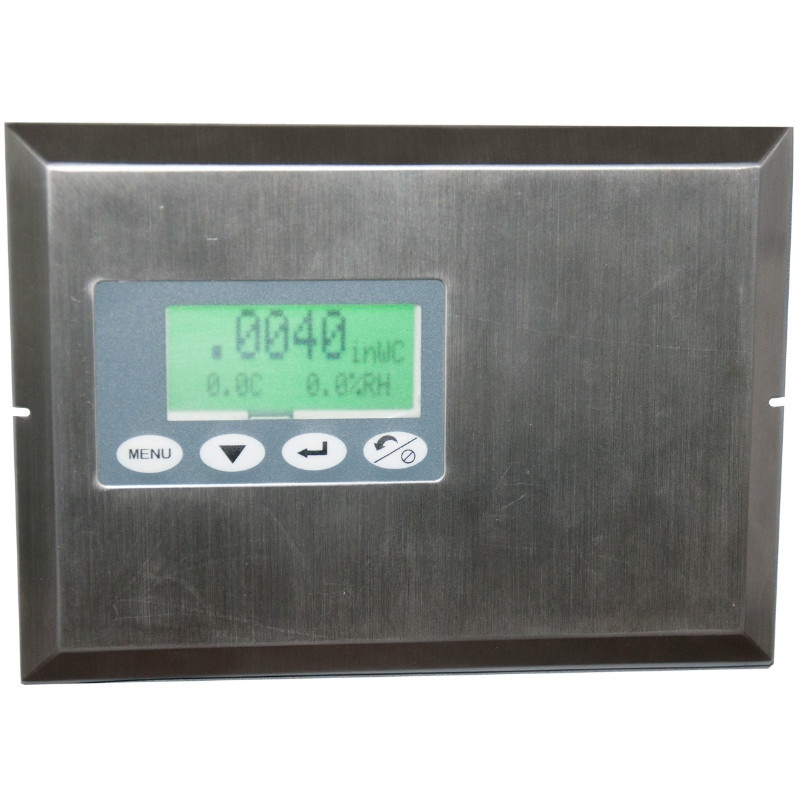 High and low alarm set-points for each parameter are easily configurable through a four-button membrane keypad. A digital input is also provided to show door status. Three Color Easy-to-See Status Screen - The SRIMV utilizes a three-color backlit screen which allows the end user to easily view the status of the monitored space with green (normal), yellow (warning) and red (alarm) status screens. Alarms can be configured to be delayed to ensure that each SRIMV is configured to the specific needs of the end user. Save Time and Money on Calibration - With requirements in place to calibrate pressure sensors anywhere from 1-3 times annually, the Setra SRIMV offers a solution to help you save on calibration time. The SRIMV allows the end user to remove the sensor without detaching any wiring or plumbing, attach to the Setra calibration fixture and complete the calibration in minutes.